It was just a matter of time and here it is: the first valet to get busted doing bad things to a nice Corvette, all caught on tape by the C7's dash cam and data logger. As a reminder to would-be asshats who think no one's watching you manhandle the Stingray, the new 'Vette comes equipped with the Performance Data Recorder (PDR), a video camera with a data overlay showing everything from speed to gear to revs and Gs. It also has a Valet Mode, which repurposes the PDR so owners can see if their shiny new Stingray has been abused by an attendant. 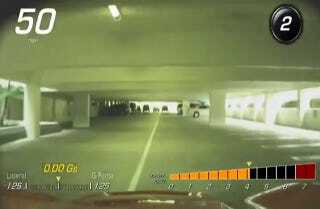 In this case, a Corvette Forum member handed over the keys at the Segerstrom Center for the Arts in Costa Mesa, after which the valet drove into the garage and performed an impromptu acceleration test, hitting 50 MPH inside. The video has since been pulled down, although it was up long enough for us to watch it and grab the screen cap above. Back up! And down again. But here's a cached version. What's more interesting is that the video doesn't have any audio, which may be the fix Chevy promised for the PDR after it was exposed that the system was illegal in 13 states, including California. Specifically, it's legal to record video without the other person's consent, but both parties have to agree when recording audio. Regardless, this is just another reminder to never, ever trust valets.